Campfire meets cookies: let's make s'moroes! Have you ever found yourself, mid-s'more, feeling like maybe, just maybe...something is missing? You're not alone, buddy. But the matter has been given much thought, and a conclusion has been reached: that missing thing is cream filling, and the solution can be found with a certain famous sandwich cookie. It's time to make S'moreos! When s'mores meet Oreos, magic--in the form of an oozy, creamy, unapologetically sweet treat--ensues. Basically, you won't be able to believe you've lived this long without them. CakeSpy Note: I made mine in the microwave, as I am not an outdoorsy type; however, if there is a campfire handy, feel free to make yours using toasted marshmallows. 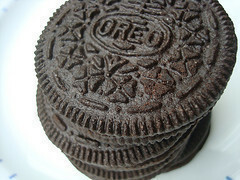 With One Oreo: If you've elected to use just one Oreo, twist it apart so that the top and bottom are separate. 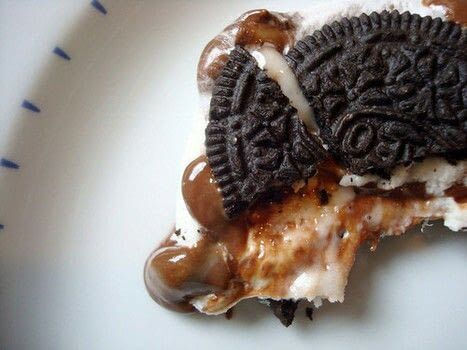 Face the filled side up, and put the chocolate squares on top, then layer the marshmallow half, then top it off with the remaining Oreo half. Put in the microwave at high for approximately 15-20 seconds. 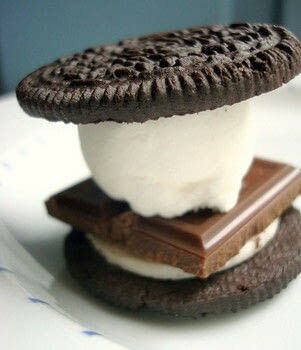 The marshmallow may rise and cause the top half of the Oreo to fall off; this is ok. Simply place it back on top upon removing from the microwave, and enjoy immediately. 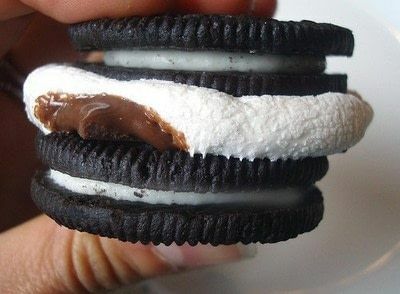 With Two Oreos: If you're going for the double Oreo version (good decision), repeat the same steps as above, simply using a whole Oreo for the top and bottom. It may take a few more seconds in the microwave, but it's oh so worth it. if you want the chocolate to melt better and be more oozy you probably want to put the oreo in with the choc only first. to avoid this completely, i just use Nutella (choc hazelnut spread) because its healthier and less chalky-tasting anyway. This is probably the most genius thing I've ever seen. I wonder how it would taste with melted caramel squared inside..? We go camping all the time during the summer ... I can't wait to try these!!! Ahh, I saw this on CakeSpy a while ago!